Dental hygiene is considered to be one of the top best health care support jobs, both financially and emotionally rewarding. Dental hygiene is listed in the top 100 jobs, according to the US News. And Forbes included dental hygiene in its list entitled, “The Best Jobs That Don’t Require a Four-Year Degree.” Dental hygienists work alongside dentists to care for patients' oral health. 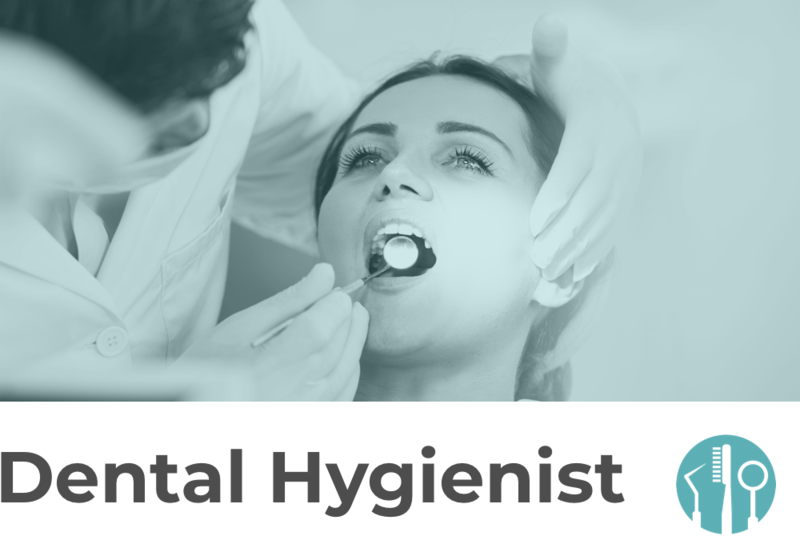 Because of the low-stress dental hygienists experience at the workplace, hygienists have a fulfilling career, and many stay in their jobs into their 60s. Learn more about the rapidly growing and expanding the field of dental hygiene. Find a local dental hygiene school course. Dental hygienists are the ones who prep their patients' mouths for the dentist. You clean the teeth and examine the mouth for signs of any concerning oral conditions such as gum disease or oral cancers. You'll also document visits and educate patients on how to take better care of and explain preventative measures of their mouths, teeth, and gums. Dental hygienists may take mouth x-rays, and apply tooth sealants and protectants. Tools hygienists use to clean teeth and gums are usually manual, powered, or ultrasonic, and they may use lasers, as well. Dental hygienists perform their duties in a variety of settings beyond dentist offices. Ypu can be employed in community health centers, nursing homes, prisons, schools and colleges, and state and federal government facilities. Passionate about the position: You need to love all things oral health because you are the one who informs and educates your patients on best practices. Also, patients love hygienists who are enthusiastic and outgoing; it makes for a better visit because not too many people love visiting their dentist. Most dental hygienists start out in a community college or trade school in the dental hygiene program. Typically, an Associate of Applied Science in Dental Hygiene is the most common path and the one most preferred by potential employers. Most dental hygiene programs require one year of college curriculum before entering the program with a grade point average of 2.5 or higher. Programs will take anywhere from two to four years. All programs are similar, whether you’re going for an associate degree or bachelor’s degree. Both have general ed classes, as well as those that pertain directly to dental hygiene. However, when going for a bachelor’s degree, the courses get more in-depth, giving you a deeper knowledge of the field. While the bachelor’s degree option is perfect for those who plan on teaching, going into the research aspect of dental hygiene, or work in a clinical setting for schools or public health programs, an associate degree plus the certification is all that’s necessary to be employable. In the associate degree program for dental hygiene, there are 24 credits of general education and 50 credits of core courses required, along with 8 elective credits. Bachelor’s degrees have a higher course credit requirement, with 45 general elective credits, 68 core class credits, and 6 elective credits. Dental hygiene coursework will include both classroom and hands-on learning. Most programs include anatomy and physiology, microbiology and immunology, intro to dental hygiene, dental anatomy, periodontics, head and neck anatomy, and radiology in their curriculum. How Much Does Dental Hygiene School Cost? One thing to be aware of when looking for a dental hygiene program: If it is not accredited, there are no available government funds for financial aid. To receive any financial aid, the program you’re considering MUST be approved by the Commission on Dental Accreditation. For full financial aid information, please refer to this article. Also, be sure to discuss your options with the financial aid office of whichever program you choose to attend. 1. Graduate from an accredited dental hygiene program. 2. Complete and pass written portion of National Board Dental Hygiene Exam. 3. Complete state or regional portion of exam. Public health: Public health programs are typically funded by the government. Dental hygienists who work in the public health field are usually providing care to those who wouldn’t otherwise be able to afford it. Examples of public health opportunities are Indian Reservation Health Services, health departments, Head Start programs, and state public health officers. Pediatric and periodontal dental hygienists both earn an annual salary of $72,330. Both are rewarding specialties, as well. Dental hygiene is one of the highest paying vocational careers. Benefits and pay vary by employer, however, the median annual wage, or the national average, for dental hygienists is $74K. The lower 10 percent earn $51K while the highest 10 percent will make over $101K per year. What Are The Licensing Requirements For Dental Hygienists? Each state has different licensing requirements for dental hygienists. One thing is certain across the country, to practice as a dental hygienist, you must be certified. To be eligible for certification, you must graduate from an accredited dental hygiene program. There are a large number of Commission on Dental Accreditation (CODA) certified programs throughout the United States. After you’ve completed the dental hygiene program, you must pass the National Board Dental Hygiene Examination given by the American Dental Association. The test has 350 multiple choice questions, and you must get a minimum score of 70 percent to pass. You will also be required to complete a clinical board exam on either the state or regional level.